A few weeks back we visited the Galgorm Resort and Spa for an overnight stay (you can read more about that trip here). While we were more than impressed by the hotel facilities, and in particular the outdoor Thermal Village and spa facilities, there was another aspect of the stay that really took our breath away – the food. 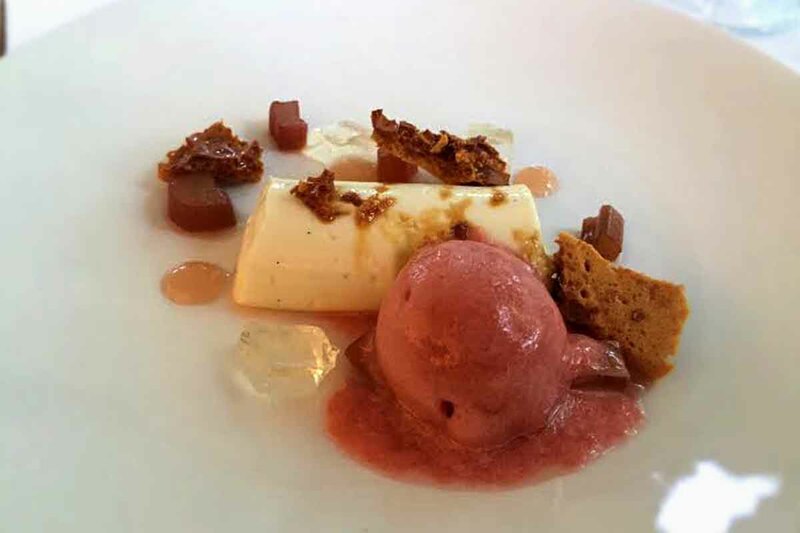 We dined at the River Room on our first night, and it was a dining experience to remember. It feels like every restaurant we’ve been to in the past 3-4 months has exceeded our expectations, and the River Room was another dining experience where this was the case. The River Room is one of only four restaurants in Northern Ireland to be awarded 3 AA Rosettes thanks to the hard work of head chef Jonnie Boyd. As we arrived, we took a seat in the Champagne Bar to enjoy a couple of cocktails before tucking into our food. The Gin fans among you would likely get a little excited in the Galgorm’s Champagne Bar as it houses some 300 varities of Gin, which must make it one of the largest Gin bars in Ireland. So with a few cocktails to wet the whistle, it was time to take our seats, as we eagerly looked forward to the food that was about to be served to us. First up was a selection of canapes which helped get our palettes reasy for the meal ahead. 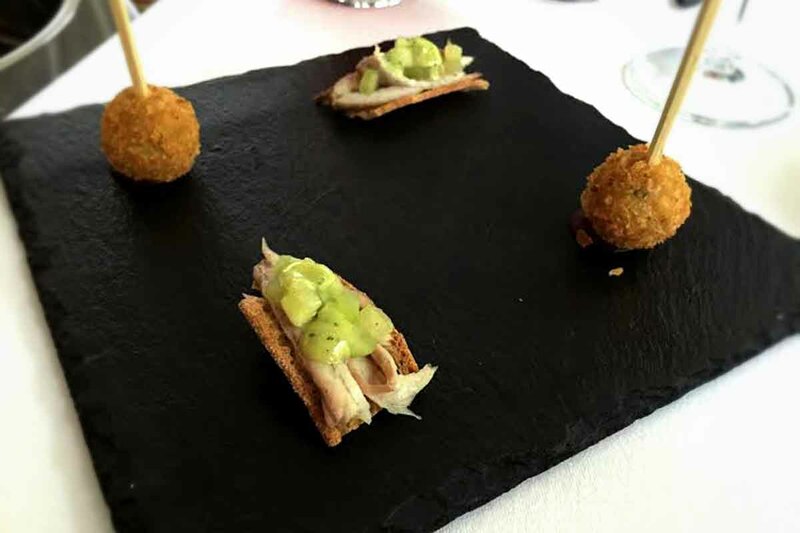 The canapes included a blue cheese fritter with beetroot jam and a smoked eel, cucumber and dill mixture, served on melba toast. This was our second time tasting eel (we also had it at a banquet event for the NI year of food and drink), and it’s a fish that we’re certainly warming to. A great start to the evening. Our starter dishes were seared scallops and quail breast. 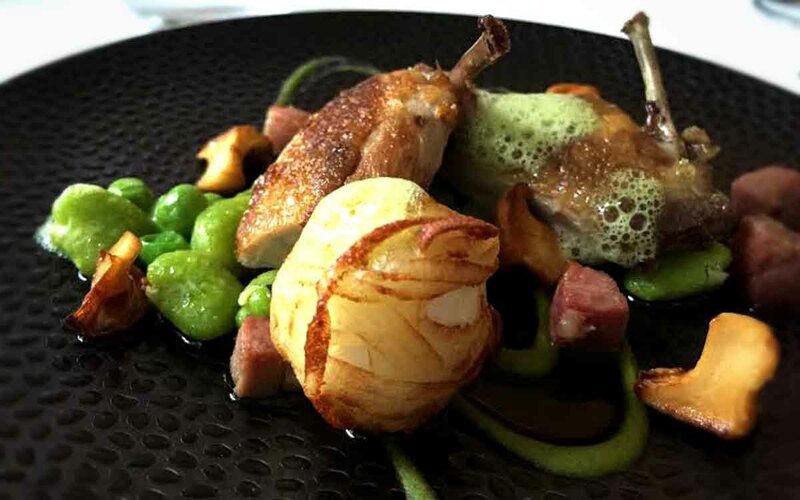 The seared scallop dish was served with hay baked celeriac, apple, guanciale and fennel pollen, while the roast quail breast was served with a potato wrapped quails egg, broad beans, bacon and girolles. Both starters were cooked to absolute perfection and it was the first time either of us had tried quail – we weren’t disappointed. The quail had quite a delicate flavour to it with the crispy skin adding great texture. 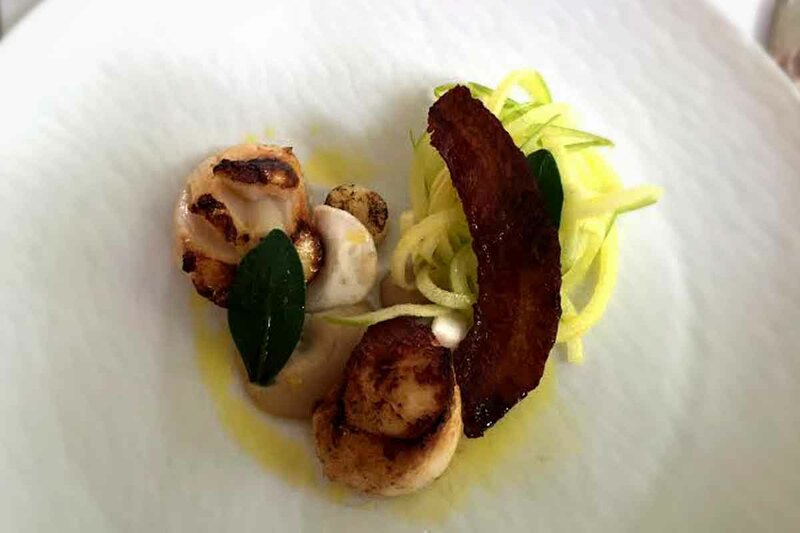 The seared scallops were fresh, with the celeriac, apple and fennel adding to the freshness of the dish. 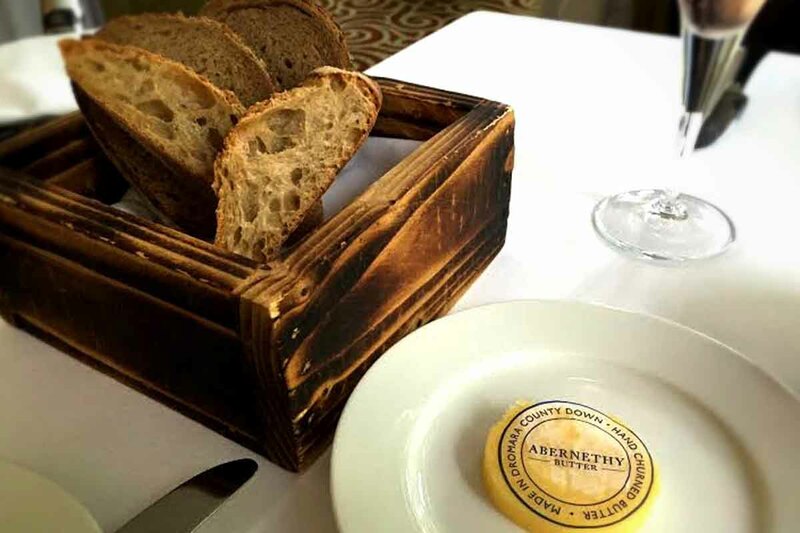 The starters were accompanied by a selection of homemade breads and the fantastic Abernethy Butter. The highlight of any menu, the main course in the River Room certainly delivered for us. We opted for the lamb and beef dishes on the menu, and this turned out to be a great call for us both. 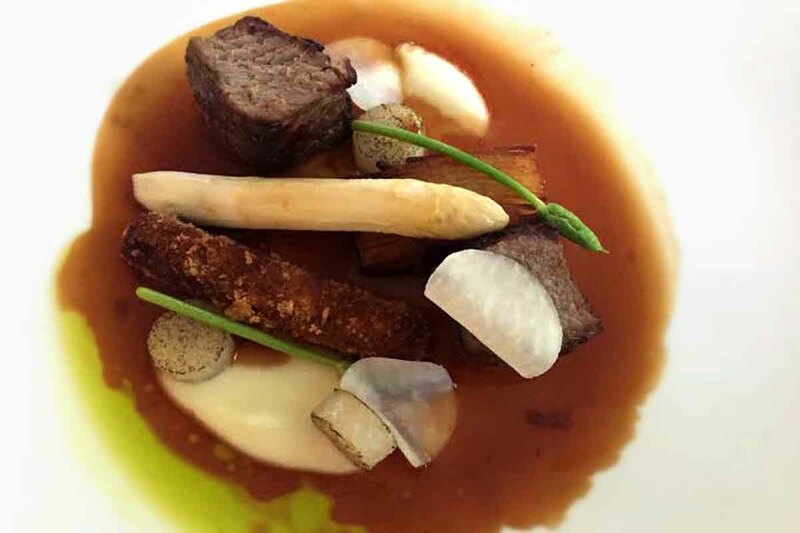 The lamb was cooked to perfection and served with a lamb meat fritter (a lovely wee surprise), kohlrabi, asparagus and wild garlic – something we’re seeing more and more of in dishes. Indeed, the addition of the wild garlic really lifted the flavours and enhanced the dish. 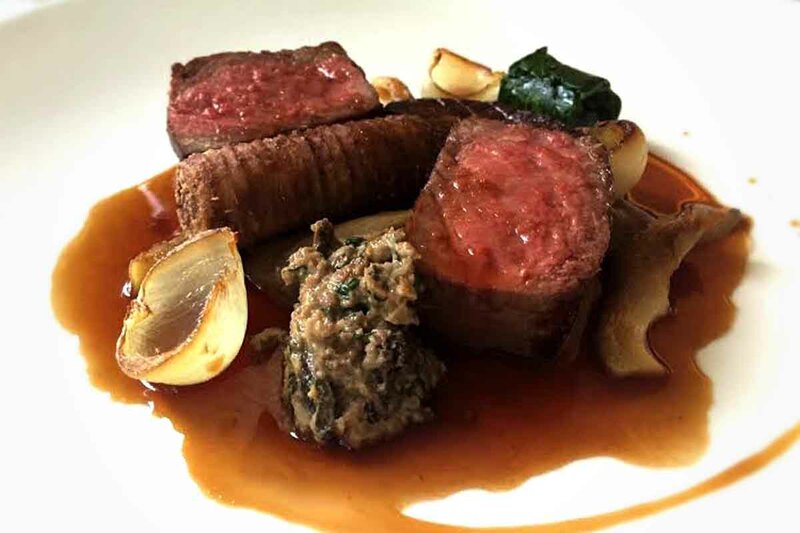 The beef was a sirloin cut and it was served with a beef fritter, foie gras, spinach, onion and truffle. This really was fine dining at its best and a truly memorable dining experience. The beef fritter had bags of flavour, and while the beef itself was cooked to absolute perfection, I’d have happily eaten a plate of the fritters with the foie gras and truffle. Big, bold flavours that give you the sort of smack in the face you look forward to! 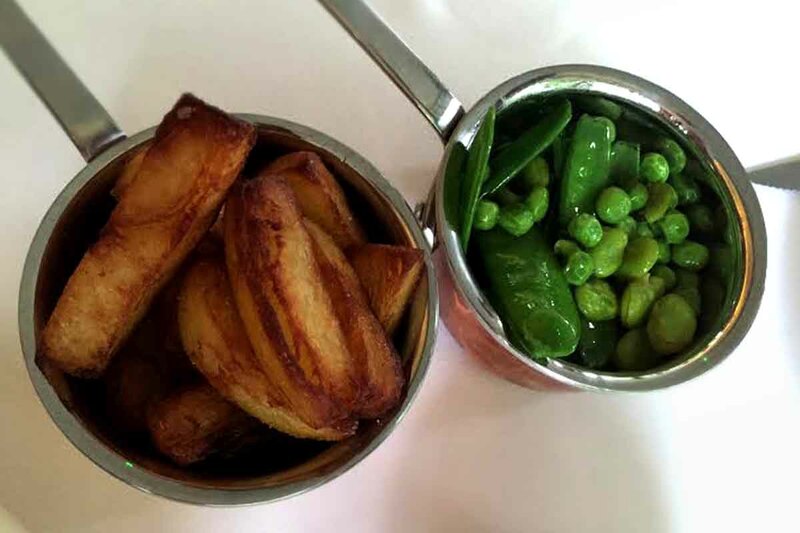 Both dishes were served with a selection of vegetables and a wonderful jus which just perfectly complemented the lamb and beef on offer. With the mains over and done with, and a glass of champers to wash things down with, it was time to look forward to dessert. With a great selection of desserts on offer, it was hard to decide what to go for, but in the end we went with the buttermilk panacotta and the passion fruit soufflé. 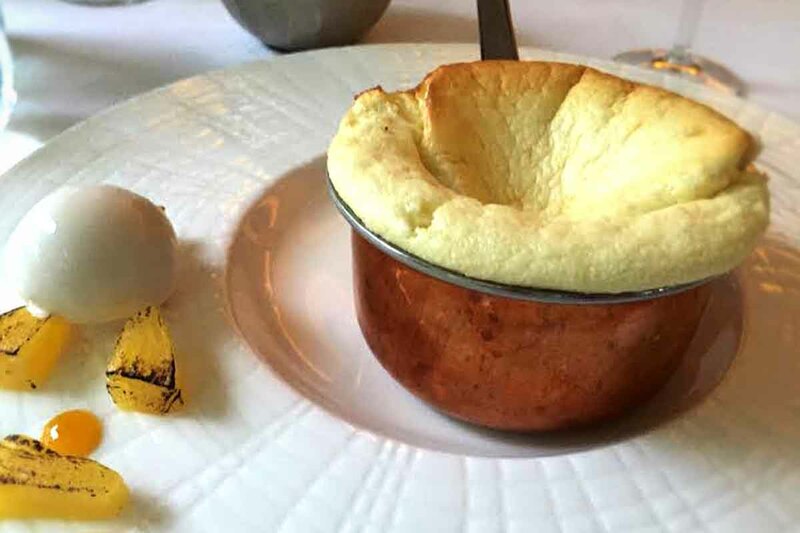 The panacotta was served with honeycomb and the soufflé served with coconut ice cream and pineapple pieces. Both dishes offered different texture and flavour combinations on the tongue, and it was a great way to finish what had been a great dining experience. Just as we thought we were finished for the evening, the chef sent us down a selection of petit fours. 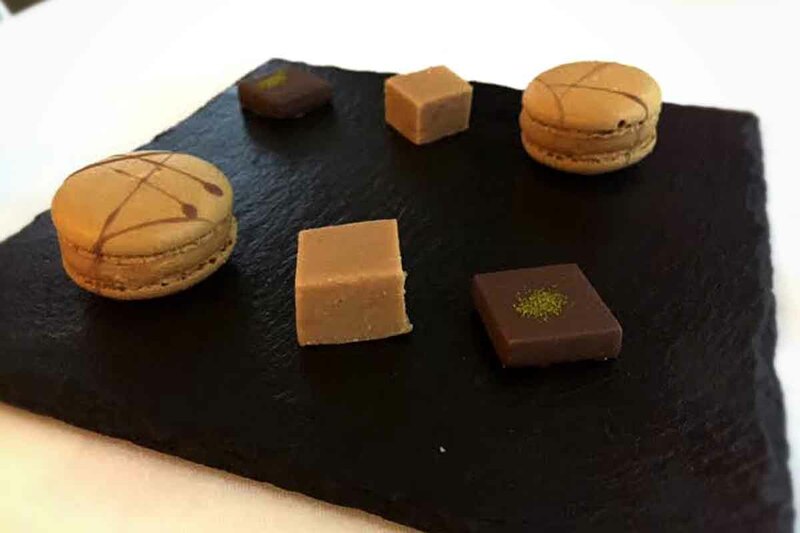 Having had 3 amazing courses, the selection of petit fours was a great way to finish our meal, as we relaxed looking out at the gardens and river flowing down the side of the hotel. We were impressed by both the food and service in the River Room, and with the hotel ticking all the boxes during our stay, we can’t wait to get back. It’s a shame that we live so far from the Galgorm and River Room (just over a 90 minute drive) because if it was on our doorstep we’d likely visit on a regular basis. 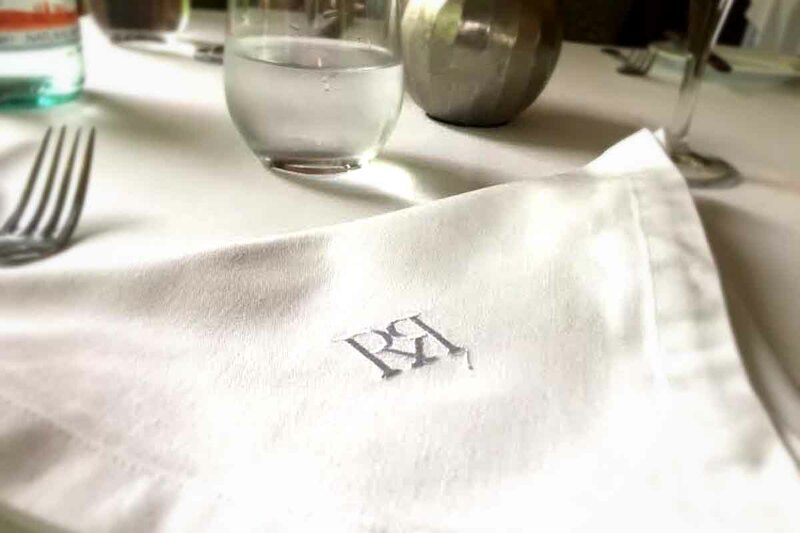 The food did leave an impression on us though, and we would highly recommend booking a table in the River Room if you are ever staying in the Galgorm, or even just in the area for the day. Here’s a video of our stay at the Galgorm. Have you ever visited the hotel or the River Room? We’d love to hear what you though of it. Let us know by commenting below, or sharing your thoughts with us on Facebook and Twitter.